It's easy to be cynical about it. It was late. It was buggy. It was slow. It was a miracle it ever got out the door. Even so, WP Plus spells out Wang Labs' future in text editing; it is of strategic importance for their long-term success. WP Plus is Wang's alpha-omega, their A - Z word processor. But to understand and appreciate this product's rocky road to the marketplace, we must examine what went on behind the scenes during the development process and re-examine today's version to see how it ties in with Wang's future. And in a related article on page 38, we'll look at one of Wang's best-kept secrets, the Wang Information Transfer Architecture (WITA), a product intimately tied to WP Plus. WP Plus' forerunner: The "V3 Editor"
Christened the "V3 Editor," the demonstration code for WP Plus was available in 1979, with the original release scheduled to coincide with the Alliance's debut. As a former member of the word-processing team recalls: "In 1978, Harold Koplow hired a guy to head up the WP group. This man had a group of 34 people who designed this new WP editor, the `V3.' We all respected him because he had a computer science doctorate, but apparently he was a very poor manager. "At some point in 1981, Koplow asked, `What's the status of the V3 Editor?' They sent someone to see what was going on with Alliance WP. From what I understand, there wasn't much to show from the previous two years. They'd developed a demo they took to all the offices, but this wonderful new editor didn't even exist. They faked it. They'd written this screen editor to fake everything. "Other programmers were shocked. The first thing they did was move the OIS Editor over to the Alliance. It took three months, but they finally got Alliance WP into Quality Assurance (QA) by February 1982. "The V3 Editor died, so another group was formed to work on what was called the `V4 Editor' (WP Plus). Creating this editor was more difficult than they imagined. As it turned out, Wang's original document structure couldn't support all the features necessary for a state-of-the-art word processor. The group went through some five different document structures -- they'd try one and if it didn't work, they'd try another. Most of the work was spent designing this compound document structure that supports text, data, voice, graphics and images." In April 1983, Fred Wang, then head of R&D, was invited to a demo on the current status of WP Plus. When shown the new and superior method of scrolling and the multiple-level insert, he was reportedly "unimpressed." When informed that the company's goal was to create the next-generation word processor, he pointed to the screen and said "I want to see a picture here" before making his exit. The development group stopped work on WP Plus at that point, instead focusing their efforts on writing the code that would allow a CHARTER graph to appear in a WP Plus document. Satisfied with their efforts, another demonstration was scheduled for June 22, 1983, with Dr. Wang, Fred Wang, then-president and CEO John Cunningham, and assorted Wang dignitaries present. The fate of WP Plus was to be decided. Says one person in attendance that day, "Everyone was impressed, too impressed. Even though it was only 40 percent complete -- and contrary to promises made to the group -- WP Plus was announced to the world on October 4, 1983, with delivery scheduled for June 1984. "WP Plus didn't make its deadline. It turned out the code for handling multiple columns was extremely hard to write. In fact, it was so difficult that the whole file structure had to be changed. The code for the format line had to be rewritten. INSERT had to be rewritten. Everything had to be rewritten." Another problem in releasing WP Plus was the priority placed on the Wang Office Assistant (WOA). According to a source familiar with the WOA, "Believe it or not, the person in charge of the project thought the WOA would replace the VS and OIS. For reasons known but to God, he decided to make the machine incompatible with everything else. In fact, the WOA wasn't even compatible with the Wang PC. People `killed' themselves for this project, but in the end, all you had was word processing. There were so many intelligent people -- QA, tech writing, marketing and other support people -- who were taken off WP Plus and reassigned to the WOA." WP Plus' column design was finally completed in January 1984. Although scheduled to ship in June, WP Plus hadn't successfully completed the QA cycle. Every time it went into QA, there were bugs. As one programmer recounts, "We got it out even though it was late, buggy (200 Priority 1 bugs) and slow." VS Version 1.0 of WP Plus was finally released in December 1985 -- 18 months behind schedule -- but minus the bugs that plagued the May 1985 OIS version (see Figure 1). 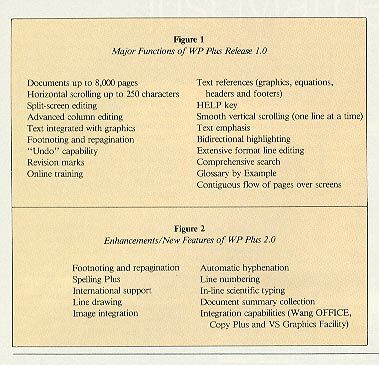 VS Version 2.0, released July 1986, won notoriety as the first WP editor to be certified by Wang's QA department (see Figure 2). Forthcoming Release 2.10 for the VS (scheduled for February 1987) addresses the speed problems of earlier releases. Previously, it took 45 seconds to get into a document; 2.10 cuts that time to eight seconds. Going from menu to menu or "Edit A Document" took 10 seconds, now it takes two. One beta site user notes further improvements. "They've cut the I/O from 86 to something like 40, which means there should be a 100 percent performance improvement. They've done other things in the area of screen display and they've added the quick edit feature from Alliance." WP Plus's future directions can be split into two areas: VS-based (including support for Advent, Sun, Apollo, 2110 and 42X workstations) and PC-based (Wang LapTop, PC/APC, PC 280/240, WOA, IBM AT and compatibles). Future enhancements will undoubtedly surface first on the VS --Wang's major marketing thrust. Many of these improvements will be dictated by the needs of the specific vertical markets Wang is trying to penetrate, notably the legal industry. Already, WP Plus Release 3.0 is scheduled to include "legal" features. With their recent desktop publishing announcement (see Business Briefs, page 8), it's apparent that Wang will provide interfaces between WP Plus and the electronic publishing world. It's safe to assume that support for Adobe Systems' PostScript and Aldus Corporation's PageMaker, and proportional spacing will be added to WP Plus Release 3.0. The November 26 issue of TechKnowledge announced that Wang will support the Computer Graphics Interface and Computer Graphics Metafile for the Wang PC/APC and LapTop -- a clear indication that the PC version of WP Plus will soon accept these graph types. Wang has publicly stated: "Mechanisms are being developed to provide compatibility between the Wang PC Computer Graphics Metafile and the Wang Metafile, which is the standard file format for the interchange of graphics information among Wang machines." The inference is that you'll be able to import PC graphics into VS-based applications. Another interesting, albeit confusing, tidbit appeared in the WP Plus Sales & Support Pocket Guide (700-9950). It said Release 2.0 will support a spreadsheet. It doesn't. The most exciting development in the WP Plus venue is the imminent release of "PC Plus" (or "PC Next," scheduled for April 1987 release). As with most unannounced products, information is scarce. The word on the street has PC Plus as a subset of WP Plus, with features not found in the original. In an article entitled "On a Wang and a Prayer" (PC World, September 1986), I compared Wang Word Processing for the IBM PC with MultiMate Advantage. Both products were found lacking: "Both manufacturers had better act fast to clear up their respective programs' deficiencies. Not only are other Wang-oriented programs, such as Office Solutions' Office Writer, competing on their turf, but some users are beginning to look outside the Wang world altogether. They may find that, with a little retraining, they can get more features and better performance with document-oriented programs." Indications are that PC Plus will go a long way toward eliminating those deficiencies. The only functions lacking may be an outline organizer and full support for multiple fonts on laser printers. It hasn't been a smooth transition, but it appears that WP Plus's former speed, bug and performance problems have been worked out in VS Release 2.10. Most significant, the PC-based version might finally turn Wang from pretender to contender in the IBM marketplace. At the very least, it should appease Wang's installed base. Until I actually get my hands on these products, I'll withhold final judgment. But I'm willing to give Wang one more chance. I think we all should.